The South Carolina state employee pension system is in trouble and that could cost you. We cannot allow bad practices to drag down our pension system with taxpayers eventually being asked to bail out the financial shortfall. The SC Retirement System Investment Commission’s (RSIC) performance is failing, resulting in costly outcomes. This is the group charged with managing the retirement investments of public employees at the state and local level. A report by the Legislative Audit Council calls the retirement system “significantly underfunded” and that “it under-reported the risk” of its investments. The RCIS also pays hundreds of millions of dollars annually in management fees contributing significantly to that underperformance. The RSIC has over-promised and under-performed. In doing so, they have created an unfunded liability – a difference between the amount of money the state will need to uphold its contracts with retired employees and the revenue the State’s pension fund is generating to cover those future costs. Legislators must make sure you, the taxpayer, do not pay more to shore up bad decision making and the poor performance on the part of those on the investment commission who make those decisions. There is some good news for the South Carolina Retirement System. Based on the reforms the General Assembly instituted in 2012, both the government and public employees are currently contributing enough to rectify this funding deficiency over the course of the next 30 years should the fund achieve its benchmark of 7.5% returns. That is a good first step. Regretfully, several issues counter the good news. First, that fund has, for the last several years, failed to meet its benchmark for returns. That underperformance amounts to over $7.1 billion over the last decade. Secondly, the current plan to service the fund’s debt is akin to making the minimum payment on a credit card for 30 years. Lastly, management fees paid to outsiders have skyrocketed from $23 million in 2004 to a peak of $468 million in 2013-14, an increase of 2000 percent! A few states have successfully reformed their pension systems. We must learn from their decisions to help South Carolina chart a course forward. These states made a hard choice to tighten their belts and reform their systems before their debt became an onerous burden on taxpayers. The policies these states implemented include adopting defined contribution plans – similar to a 401(k) – that is universal in the private sector. Private companies, many years ago, saw the insolvency brought on by defined benefit plans. We can and should follow these states by pursuing common sense policies to reform our pension fund before it is too late. The core issue for the South Carolina Retirement System is the size of our unfunded liability. The unfunded liability is at least $20 billion and, depending on who is calculating future payments, it may be as much as $40 billion. The 7.5% returns that we task our state pension fund managers to produce every year are partially fueling the unfunded liability. This legislatively set benchmark is unrealistic and needs to be adjusted. For the last ten years, our rate of return has averaged only 5.06%. We must adjust our expectations and our calculations to match our real-world experience. The poor return is a recipe for disaster. Fortunately, House Speaker Jay Lucas and Senate President Hugh Leatherman have formed a special legislative committee to develop pension reforms. Everything must be on the table – hybrid benefit and contribution plans, COLAs, state and employee payroll contributions, and a sound liability payoff schedule, to name a few. With the special committee’s work over the coming months, the legislature will be in a position to consider common-sense reforms to make our public employee pension fund stable and reliable. This is a complex issue that will require tough decisions that will impact the pension system for decades to come. Finally, like with all difficult, controversial and costly issues, legislators must have the political courage to solve the retirement system ills now and get us back to a properly funded future. 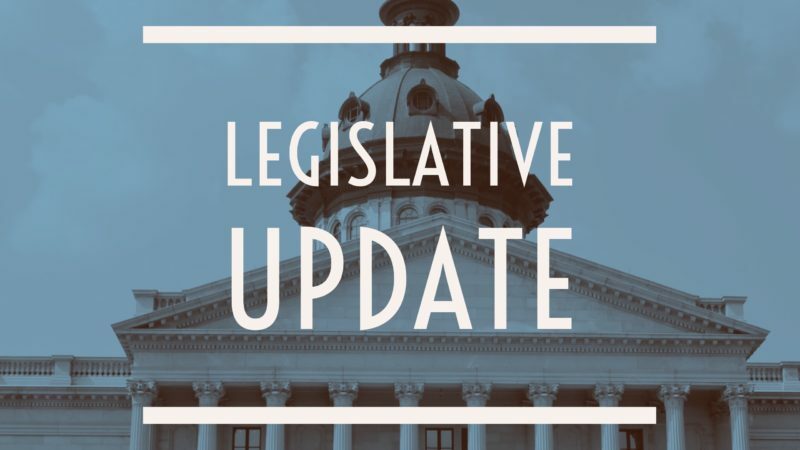 This is a complicated issue that demands the kind of policy that satisfies the needs of South Carolina’s taxpayers and public employees at the state, county, and municipal levels. Choosing to focus on this difficult issue now will save us from being forced to grapple with a much more desperate crisis later. If you need assistance or have any thoughts or concerns about what we are doing, please do not hesitate to contact me.